Our technique of laparoscopic radical cystectomy with completely intracorporeal construction of urinary diversion (40) and laparoscopic extended pelvic lymph node dissection have previously been described (41). With the patient in a modified dorsal lithotomy position, a transperitoneal five-port technique is employed. A modification for extended pelvic lymph node dissection involves placing the primary port in a supra-umbilical position to facilitate proximal dissection to the aortic bifurcation. Cystectomy is performed initially, followed by pelvic lymph node dissection beginning with the right side. We elect to perform pelvic lymph node dissection after cystectomy in order not to compromise tissue planes. The patient is tilted 30° up on the right side and with 30° Trendelenburg. Although we prefer J-hook electrocautery as our primary instrument of dissection, coagulating laparoscopic endoshears with or without bipolar electrocautery is also effective. The lateral border of the dissection is developed medial to the genitofemoral nerve exposing the iliopsoas muscle. 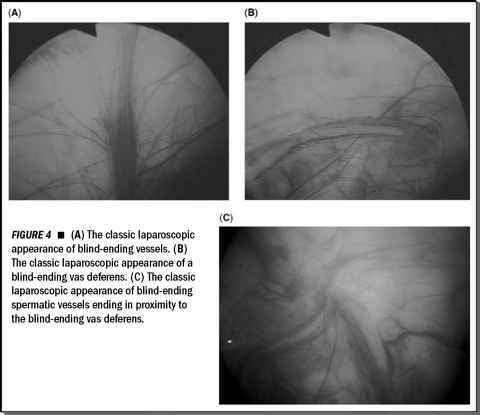 The fibroareolar and lymphatic tissue packet is lifted en bloc off the surface of the iliopsoas and swept medially, posterior to the external iliac artery and vein after the tissue anterior to the external iliac artery and vein is individually split longitudinally using J-hook electrocautery. The external iliac vein typically appears flat with standard (15 mmHg) pneumoperitoneum pressures. To enhance visualization of the vein and its edges the pneu-moperitoneum pressure can be decreased to 5 mmHg. The obturator lymph node tissue is carefully dissected off the obturator nerve and maintained in continuity with the tissue that had been dissected off the external iliac artery and vein. A large clip is applied distally, and endoshears, are used to release the lymphatic tissue packet from this location. One of the initial steps in laparoscopic radical cystectomy is dissection and transection of the ureters. The transected ureters are mobilized away and tacked to the sidewall facilitating cephalad dissection along the common iliac artery during pelvic lymph node dissection. The common iliac artery is circumferentially mobilized and retracted with a vessel loop to improve access to the lymphatic tissue in the area immediately distal to the aortic bifurcation. Upon completion of the proximal dissection, the specimen is immediately placed in an impermeable sac. Throughout the dissection, care must be taken to avoid cutting into any enlarged lymph node(s). Lymphadenectomy is similarly performed on the left side, but with the patient now tilted 30° up on that side. For the left-sided pelvic lymph node dissection, the surgeon may stand on the right side of the patient.